That’s MISTER Blue To You . . . 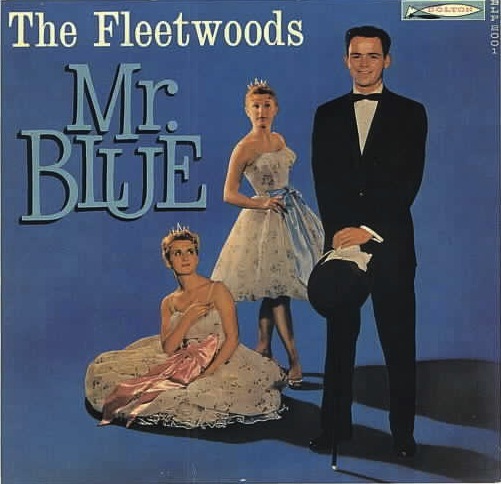 Anyone taking on the task of covering the 1959 Fleetwoods hit, Mr. Blue, has a big job on their hands. The original version has a lead vocal by The Fleetwoods’ Gary Troxel, who originally auditioned for Gretchen Christopher and Barbara Ellis, the founding members of the group, as a trumpet player, and Gary is one of the smoothest singers of that era. Still has his chops, eh? I’ve seen recent videos of him in the current incarnation of The Fleetwoods, and he still has the seemingly easy delivery he had as a teenager. This great and evocative song is a bear to sing, especially if you’re playing an instrument at the same time. I’ve always ditched the spoken intro, which I consider a tad too hokey; Pat Boone’s cover from 1962 or so also ditched it. Interestingly, The Fleetwoods, who were from Washington state, I believe, always recorded their vocals accappella, and their LA producer would drop in the instruments later. Glen Campbell on guitar and Leon Russell on keyboards worked on their records, so they didn’t lack for talent! I have no info on Steven other than I envy him not only his vocal talents but the maple-necked sunburst Tele on the wall behind him in this video. He chose to use a Boss harmony pedal instead of background vocalists but otherwise he nails a very difficult project with elan. Why he hides his face behind his microphone and pop filter is a mystery.